If you've driven down Seminole Road in Atlantic Beach recently, you may have noticed small signs posted on the front lawns of many houses. ATLANTIC BEACH, Fla. - If you’ve driven down Seminole Road in Atlantic Beach recently, you may have noticed small signs posted on the front lawns of many houses. David Jeffrey is the man behind the signs. He told First Coast News it's not a political statement, rather a testament to the one force that transcends party lines. Jeffery is a retired Episcopal priest who said he spent his life doing what he could to help others. He grew frustrated recently when peripheral neuropathy, a condition caused by nerve damage, left him in pain and limited his mobility. But one day, like divine intervention, he got an idea. Jeffery and Priscilla, his wife of 37 years, put the first sign outside their home. “Somebody said they wanted one, and somebody else said they wanted one and off it went,” Jeffery said. At least 250 signs have been distributed, landing in homes as close as Atlantic Beach and as far as Michigan. The Jeffery’s said they never expected it to spread as it has. Maybe it’s because, in a time when it seems so much divides people, the term “love” has gotten distorted. To the Jeffery’s, love isn’t a feeling, rather it's an action. It’s caring for someone, being kind or helping someone in need, regardless of race, religion, political affiliation or anything else. It’s not always easy, but it’s our job, Jeffery said. "You instinctively may not care for somebody, we all have that,” he said. “But at the same time, we don't get to pick and choose the people who come in front of us that might need that little bit of love." It's important to remember that if you have a sign like this it must be posted on your own, private property. 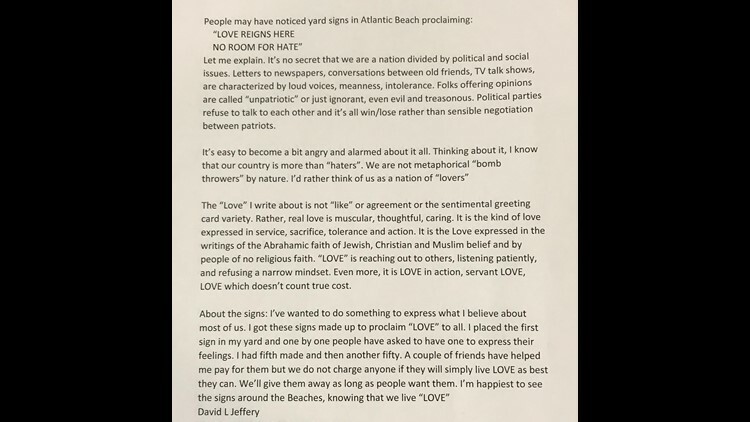 If you are interested in getting a “Love Reigns Here” sign, you can contact First Coast News reporter Juliette Dryer at jmdryer@firstcoastnews.com.